Lyman Hall was a doctor, minister, and statesman from Connecticut who traveled throughout the original 13 colonies during the latter half of the 18th century. 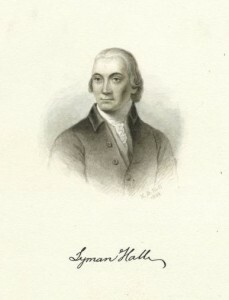 Hall served in the Second Continental Congress and signed the Declaration of Independence. Although he spent the later stages of his life in the South, Connecticut residents continue to honor his memory as one of the state’s most famous native sons. Lyman Hall was born in Wallingford on April 12, 1724. After graduating from Yale College in 1747, he studied theology and, like his father, became ordained as a minister. Hall’s short-lived career as preacher began in Fairfield in 1749, but he soon abandoned the ministry, undertook an apprenticeship in medicine, and returned to Wallingford to set up practice as a physician. In 1756 or ’57, after only a short period in Wallingford, Hall relocated to the South, moving between South Carolina and Georgia several times before finally settling in Georgia in 1774. Now a plantation owner, as well as a physician, Hall engaged himself in colonial politics. Serving in the Second Continental Congress from 1775 to 1777, he played a vital role in securing food and medicine for the Continental army and became a signer of the Declaration of Independence—after language condemning England’s King George for continuing the foreign slave trade was removed. Hall’s fellow Georgia delegates and others embedded in the plantation economy (including some New Englanders) lobbied successfully to exclude the passage. When the British captured Savannah, they burned Hall’s property and accused him of high treason. Hall fled to South Carolina and eventually came back to Connecticut to stay with family. He returned to Georgia in 1782 and served as governor there in 1783, followed by one year terms as a member of the state assembly and as a judge, and, finally, retirement from public service. 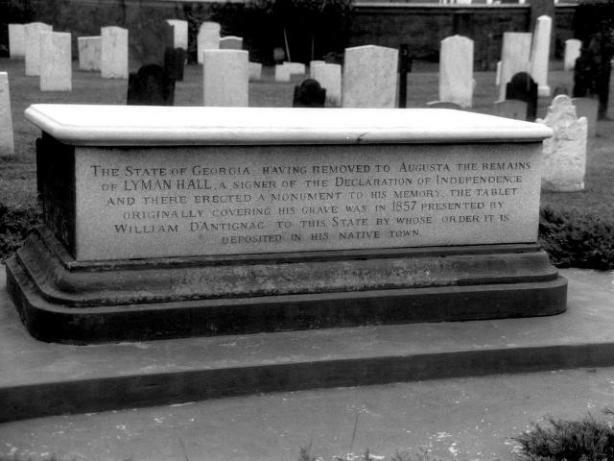 Lyman Hall died in Burke County, Georgia, on October 19, 1790. In 1848, authorities removed his body from its original resting place and interred it beneath a monument in front of the courthouse on Greene Street in Augusta, Georgia. They also sent his original gravestone to Wallingford, Connecticut, for display as a memorial in the local cemetery. The Lyman Hall memorial at the Center Street Cemetery in Wallingford is just one of the ways the town found to mark Hall’s contributions to the American independence movement. In 1895, residents of Meriden (formerly a part of Wallingford) began the Lyman Hall Society. Just over 20 years later, Wallingford hosted Lyman Hall Day, featuring, among other things, a parade and the laying of a cornerstone for what today is still Lyman Hall High School.